Thank the maker! Todays POTF2 update rounds out the flashback figures in our guide with, well, the maker and his droid. Anakin Skywalker, with a lightsaber that he most likely borrowed from Obi-Wan, and his trusty creation, C-3PO. The guys over at The Private Universe have a report that Zoo Magazine has the low down on a live action TV show featuring Daniel Logan as Boba Fett. Check it out right here! September 30 is here and that means this is the last day to enter this month's contest! All you need to do is send in your customs to customs@jeditemplearchives.com and you will be entered into a random draw for a Julian Glover autograph and Sly Moore and Padm� Amidala figures!! No...they don't need to be posted on the site to qualify, all you need to do is send them in, so why wait, you got the photos already, just attach them to an e-mail and you could get free stuff! Today Juan Manuel sent us a special treat by sharing his General Grievous figure that won 1st place in the Encuentros 2004 in the contest for Custom Figure Category! He also added a few customs from the Millennium Falcon. Check them out in the Customs Corner or by clicking the thumbnails below! We've got a special bonus VG update today with the Wal*Mart Early Bird kit being added to the ROTS Exclusives section today. The kit comes complete with 2 brand new sculpts of Luke Skywalker and Princess Leia and a Chewbacca with a brand new head sculpt that captures him for the first time without him showing his pearly whites! R2-D2 in a watered down VOTC version rounds out the set along with 10 figure pegs 1970's style! Head on over to Alliance Collectibles to pick up your Early Bird Kit...or even an extra so you can display the figures both in and out of the packaging! They've also got the Target Lava Vader & Obi-Wan along with the Utapau Shadow Trooper in stock so get them while they last! Mark Tobin sent in his great Commander Cody custom to be added into the Customs Corner today...nope, he doesn't need Hasbro to come up with one for him to buy! Mark is also entered into this month's contest to be entered in the draw for a Julian Glover autograph and Sly Moore and Padm� Amidala figures!! Check out all the details right here but don't hesitate...tomorrow, September 30th at midnight is the deadline! Send your customs in to customs@jeditemplearchives.com and be sure to have a chance to win the prize! The LEGO Visual Guides have a new addition in the ROTS section today. The General Grievous Chase has some very cool pieces in this building set including Grievous' Wheelbike and Boga along with Obi-Wan and General Grievous minifigs! Check them out in the images below! New Sponsor Welcome! You Buy Now! The Batman - 4 new figures from "The Batman" line. That's it for this weeks update, we will have more to announce next week. You can always stay on top of our latest offerings by checking out the "New Items" page on our web site at http://www.youbuynow.com/newitems.php Wanna read their entire newsletter...of course you do! Click here to get all the details of these great deals! Todays POTF2 update features two freeze frame figures, Prune Face & Pote Snitkin. Although to large to actually fit behind the wheel of the POTF2 skiff, Pote Snitkin is one of the nicer, hightly detailed figures from the freeze frame era. Click the images below for a closer view. Alliance Collectibles writes in to let you know that the Target Exclusive Shadow Trooper and the Lava Glow Darth Vader (sans suit) and Obi-Wan Kenobi will be arriving tomorrow! Keep an eye on the site for them to be posted so you get yours before they all sell out! While there, don't forget to pick up an Early Bird Kit too! And, if you want to add something really special to your collection, check out this AFA Graded 2002 Toy Fair Vader...nice! Hello from Toy Fellas! We received our shipment of Star Wars Unleashed & C-3PO & R2-D2 Water Globe (1 3/4-inch diameter ). We also have in stock the Star Wars Evolutions Packs & Attacktix as well. All Unleashed cards have creases on them. C-3PO & R2-D2 Water Globe $11.99 The C-3PO & R2-D2 Water Globe is a 1 3/4-inch diameter globe that features these two droids on a Tatooine-ish landscape. Base features Jawas. Today's Customs Corner addition comes from Heath Williamson also known as Hero25 in the War Room forums. Check out this clone custom and his Slave Leia custom card in his customs page! We're down to just 2 days left to e-mail us your customs to customs@jeditemplearchives.com and be entered in this month's draw for a Julian Glover autograph and Sly Moore and Padm� Amidala figures!! Check out all the details right here! 2006 is a lot closer than you think and the Star Wars shop ios ready to ring in the new year with new Star Wars Calanders! Take your choice between The Posters of Star Wars , The Complete Saga or Revenge of the Sith ...just click on the images below to enter the new year in style! Great news for all you General Grievous fans....Matthew Wood has been added to the guest list at the FACTS Convention October 15-16 in Ghent, Belgium! He joins other Star Wars guests Warwick Davis, Richard Bonehill and Jerome Blake at the show which is sure to be a hit! Unfortunately for the fans in Belgium, due to a theater play in Sydney, actor Bruce Spence has had to cancelled his appearance. Hasbro has updated their site with images and information of the TRU Exclusive Holographic Emperor. That say it is in stores now, so drop us a line when you find yours! Read more by clicking below. And, there are not on line yet, but for those of you who'd like to save a bit on gas, you can use this link to order yours. And, Hasbro has also updated with news and images about the Utapau Shadow Trooper. This bad boy features 14 points of articulation and will be in Target this fall. The Gentle Giant Visual Guide gets a nice boost in the Bust-Up section today with the addition of the Heroes of the Rebellion. This wave of bust-ups kicked off the whole line and set the standard for all the rest. Check out the entire wave by clicking below! The American Film Institute's "Top 100" lists continue to have the Star Wars Saga listed near the top in many categories. But, for The Big Picture--AFI's 100 Years of Film Scores, John Williams' score for A New Hope ranked number one! In addition John Williams hits the list three times (Jaws #6, E.T. #14) besting all other composers for most represented composer in the top 25. See the full article and top 25 at the AFI web site. Congratulations to John Williams! And yet another set of customs comes in from Mexico City and is added to the Customs Corner today! Oscar Rodr�guez Jim�nez sends in his version of Obi-Wan in Clone Trooper Armor. Just click below to check it out! There are just 3 days left to e-mail us your customs to customs@jeditemplearchives.com and be entered in this month's draw for a Julian Glover autograph and Sly Moore and Padm� Amidala figures!! Check out all the details right here! Sercan Tokdemir sent us in photos of his collection last month and it has already grown enough for him to send in a brand new batch of images! Check out Sercan's collection by clicking one of the thumbnails below! Andrew's Toyz sends in some new images of the upcoming exlusives Anakin (Lava Glow), Obi-Wan (Lava Glow), and Utapau Shadow Trooper. They will be available at their main website soon, but in the mean time you can check out his auctions! For detailed front and back carded images, click on the images below. More updates for our POTF2 guide. This time it's EV-9D9 and the bounty hunter Zuckuss. Click below to get a closer, more detailed view of these neo-classic figures. We'll continue to fill the holes in our guide while we wait for more new stuff to filter in. That's right...Amazon.com is offering a buy 2, get 1 free deal and it is a great way to get caught up on your LEGO collection and save a ton of money...up to $70! A bunch of sets even qualify for free shipping too! Click right here to see what's in stock to add to your collection! Star Wars Action News Podcast's 5th Episode is up and ready to listen to! In this issue we respond to some listener feedback, discuss several new Hasbro multi figure packs starting to show up in stores, and talk about the art of autograph collecting. If you have not caught one of their dynamic episodes yet, you don't know what you're missing out on! So, head on over to reviewstarwars.com and take it for a ride...you won't be disappointed! A few more of the Backpack Danglers have been added to the Galactic Heroes Visual Guide this afternoon. Yoda and Luke Skywalker are the latest lucky little fellas that can dangle where ever you go! Check them out below! The die cast 1:24 scale Ultra Titanium series has found it's way to Wal*Mart.com! The Republic Gunship and X-Wing are priced at just $19.99 each and are ready to ship out to your collection right now. To head on over and place your order just click on the thumbnails below. Hyperspace Japan.com was nice enough to send over some great images of the Kotobukiya Special Ops model for everyone to see. Check out the images below and if you'd like to see even more of them, head on over to Hyperspace Japan.com to see them all! Well, it seems that the rumors are true...Hasbro will be releasing Star Wars Transformers and they were revealed at Botcon 2005 and Transformer World 2005 has the images to prove it. It looks like we have a Grievous/Wheelbike, Vader/TIE, Luke/X-Wing and Obi-Wan/Jedi Starfighter on tap. Head on over to the TWF2005.com Hasbro Photo Gallery to check them out. The basic figures in our ROTS visual guide are now complete from #1 through #63! This has been a long journey and we are thrilled to bring you fully up-to-date! Check out the last to be added below, and don't forget to check out Alliance Collectibles for all the basic figures, including the latest releases! Today's Customs Corner update belongs to Jan Carlos P�rez of Mexico City! He's got a thing for cool Jedi and even believes that Gungans can play the role...why not, great warriors they are! There less than 1 week left to e-mail us your customs to customs@jeditemplearchives.comand be entered in this month's draw for a Julian Glover autograph and Sly Moore and Padm� Amidala figures!! Check out all the details right here! Pride Displays is proud to announce the overdue release of the highly anticipated 'A New Hope' diorama. It is now available to residents of the US, UK & Europe. Only 5,000 pieces have been made and supplies are limited. Pride Displays is offering free shipping all around the world...just click here, click on the "basket" button and add the diorama to the cart and you are good to go! The last 2 of the first 7 of the last 12 ROTS figures have been added to the Revenge of the Sith Visual Guide this afternoon. Grievous' Bodyguard decked out in his formal whites is added along with a Neimoidian Commander that actually comes with a Neimoidian sized weapon! Click below for a closer look. Don't forget to stop by Alliance Collectibles to get these and the rest of the first of the last of ROTS before they sell out! We are now accepting pre-orders for the second Clone Trooper to Sandtrooper evolution set. This is the new set with Grey & Battle Damage troopers and is an online exclusive. Other online exclusives such as the Holiday Edition Darth Vader and ROTS DVD Covert Ops Trooper are available as well. Order soon at Andrew's Toyz! This is the Exclusive Episode II C-3PO Mini-Bust that they will be selling at the Art of Star Wars Exhibition starting November 19th at the Singapore Science Centre and the Star Wars shop has a VERY small number of these for sale! This is one of the smaller runs of mini-busts at only 2,500 and only about 500 will be for sale through the SWS so don't think twice about getting this version of your favorite protocol droid! We've got so many updates these days you'd think it was April 2nd all over again! Just added to the Revenge of the Sith Visual Guide are a pair of clones, a pair of Separatists and a Wookiee. Sure they are repaints but Hasbro did a bang up job of making them unique figures. Gree uses the Clone #41 mold and comes with that huge cannon the AT-RT Driver sports, Bly uses the Clone Commander mold minus the funny little accessory and the Wookiee looks down right awesome in black! Passel Argente and Cat Miin are a few Separatists that were added to the bunch so your Mustafar Anakin can make quick work of them. Alliance Collectibles have these and the new Grievous Bodyguard and Neimoidian Commander in stock now...so head on over and get yours today! Todays update features the first clone trooper evolutions set, a highly detailed and highly articulated set of the Empire's finest...and Hasbro's! Check out the ROTS visual guide to see all 3 current Evolutions sets chock full of detailed images and poses. Don't forget to head over to alliance collectibles to pick up a few of these sets to start building that clone army! Early Bird Figures at Alliance Collectibles! Get them while they are hot, hot, hot! Alliance Collectibles has the Wal*Mart Early Bird figures in stock and ready to ship to you right now! Be the first on your block to have these cool exclusive figures in the collection! And, while you're there, don't forget to pick up the Sith, Clone Trooper and Anakin to Vader Evolutions packs! Head over and place your order now! The Official Site has a pair of updates for some cool toys hitting the shelves between now and the beginning of 2006. They have the low down on the first four new and improved ships in the LEGO line and information about those Episode III Commemorative DVD Packs...yep, they will be at Wal*Mart on November 1st. Entertainment Earth has the 2nd Clone Trooper Evolutions pack up for pre-order at their site. These are sure to fly off the shelves as fast as the first set of these awesome, super poseable clones, so place your order while you still can! Gentle Giant has been kind enough to send some hi-resolution images of the upcoming Hoth Bust-Ups for your viewing pleasure. Check out the entire wave by clicking the images below! Singapore Star Wars web site Starwars.sg has the breaking news that the Attack of the Clones C-3PO mini-bust that we have seen at the last few cons will be an exclusive at the Art of Star Wars Exhibition. It is a limited run of 2,500 but only 1,500 will be on tap for Singapore so there is still hope to get one somewhere else down the line. Today we add the customs of Tokdemir Sercan to the JTA Customs Corner! He offers up a great range of customs from Jedi to Tusken to Mos Eisley Slaves! Check them all out by clicking the thumbnails below! Tokdemir is entered into this months draw for the Julian Glover autograph and a pair of figures from the Post-OTC line. You can have your name added to the list just by sending in your customs to ! And remember this in only available to Collectors Society members, so if you are not one yet, now is the time to sign up! Donald Trump's Apprentice wiull be taking on a whole new meaning this season when the teams take on the Dark Side and compete to promote the Revenge of the Sith DVD and Battlefron II Video Game! The season starts on September 22 so get those VCRs ready. Read the story at the Official Site or at the Apprentice web site. What I want to know is, when somone is fired, can Donald do it with Sith lightning? Hello from Toy Fellas! We received some new Star Wars items listed below. Please note we will be out of the office from September 21st through September 25th. All orders, e-mails & phone messages will be handled on Monday September 26th. In other news that is not so hot they have updated their site with info and images of the SWS Exclusive Covert Ops Clone Trooper and of the Titanium Ultra X-Wing and Republic Gunship. Hey, it could have been worse, they could have posting an image of that thing they are calling this years holiday figure! The second of 4 evolutions sets makes their way into the ROTS visual guide. This time, the Sith Evoluion set, featuring Darth Maul, Count Dooku, and Darth Sidious in all of their Sith glory! This set doesn't let down, as each figure is highly articulated, detailed, and packed with accessories! Check out each image below for detailed guides, and keep an eye out this week because we will be bringing you the highly anticipated Clone Evolution set to the archives! If you hang in the War Room forums then you already know that Rik Biel makes some of the best 12" Clone Customs on the planet! He sent in over 100 images of all his clones and then some...including one of our favorite characters in the Saga...Jar Jar Binks! OK, maybe not our favorite character, but a custom worth checking out for sure! We're 2/3 of the way through the month and we know that you have some great customs to share with us, so why not send them in to customs@jeditemplearchives.com now so you'll have a shot at winning the Julian Glover autograph and a pair of figures from the Post-OTC line?! All the details of the contest can be found right here! Clone Wars Volume 2 followed in the footsteps of it's big brother and brought home the Emmy award for Outstanding Animated Program (for Programming One Hour or More)! Read all the details at the Official Site and don't forget to pre-order your copy at the Star Wars Shop today. Our LEGO Guru pals over at FBTB.net have some way cool images of the upcoming A-WIng for you to check out! Jump on over and check them out along with other hi resolution pics of the V-Wing and TIE Interceptor! Tonights Customs Corner update belongs to Vicman Fett of Mexico City! He's got quite a variety of customs to share from 4" figures to 12" figures and even a scale Sith Infiltrator! Check out his customs by clicking one of the images below. Toss us an e-mail with your customs to customs@jeditemplearchives.com and not only will we post them for you, but you'll have a shot at the Julian Glover autograph and a pair of figures from the Post-OTC line...Sly Moore and Padm� Amidala!! Read all the details right here! The Battle Pack barrage continues in the Revenge of the Sith Visual Guide. Today we've added a set containing all your favorite characters in their kit bashed glory. The Jedi vs. Separatists Battle Back includes Anakin. Obi-Wan and Mace vs. Jango and Darth Maul...not much of a fair fight but hey we have them for you anyway and you can check them out by clicking below or right here. Don't forget to head on over to Alliance Collectibles to pick up that 1st wave first wave of the ROTS last 12! Today's Battle Pack addition to the Revenge of the Sith Visual Guide tells the "chilling" tale of the Assault on Hoth. This 5 pack includes the POTF2 AT-AT pack in, General Veers, a Saga 2003 Snowtrooper who is flanked by two POTF2 Snowtroopers and backed up by the intel of a POTF2 Probot. While there is nothing new to this set it's a great way to build up those armies just a bit more! The StarWarsShop.com exclusive Anakin Skywalker dark chrome scaled lightsaber is finally starting to hit mailboxes, so in case you have not yet ordered it, you can have a detailed view today as we add it to Master Replicas exclusive section in our exclusives guide. This is still available to order at StarWarsShop.com, so order yours today! The Customs Corner gets another update today with the addition of Steve Ciolino's customs! They range from custom Galactic Heroes to 4" figures to full scale lightsabers! Don't forget...if you send in your customs to customs@jeditemplearchives.com and not only will we post them for you, but you'll have a shot at this month's great prizes in our Customs contest! Take a closer look in the Revenge of the Sith Visual Guide in all his glory today. Don't forget to stop by Alliance Collectibles for your Battle Packs and the first wave of the ROTS last 12! The Dark Lord of the Sith has been added to the Gentle Giant Visual Guide in all his glory today. Standing 14" tall this statue by Gentle Giant is one fine piece of work and by far one of the most impressive in the line to date! Check out the images of him by clicking below or by visiting the Gentle Giant Visual Guide! I picked up some stuff I had on layaway from WM. Figs of course. Well, they gave me the price break of $4.77 down from $5.88, so I saved $5.95 there. The lady told me that the refund was good for figs purchased dating back to MAY!!! Well, my fiancee just happened to have a receipt with her from a previous layaway. I asked the lady if I could get the difference on them. She said to check with customer service. I did, and low and behold they gave me the difference back! This was a transaction done last month! I got back $4.53. Roughly 50 cents each for the 9 figs I had bought. So folks, if you've saved you're old receipts from WM, take them back and see if they'll do a price adjustment. You may just get some money back! JTA regular and Disney Cast Member Nick S. writes in to give us an update on the Mickey-Yoda 2-packs! He says if you are on the hunt for the blue saber variant that you still have a chance at getting one but the run of these "Blue Saber" variant was only about 5,000. He also reports that the store only displays 30 at a time, so if you see the shelves empty you should not despair. And last but not least, the packs with Yoda sporting his green saber will be out soon, so keep your eyes peeled! Jabba's Royal Box: Awnings give shade to some bettors on the front box where they can conveniently seek refreshments inside the arena cantina directly under Jabba's royal box. Gardulla the Hutt lounges just inside the royal box attended by a slave Twi'lek while the Gamorrean guards keep uninvited guests away. The lucky spectators above the royal box are ecstatic when they see their favorite podracers go by. Arena Pit Hangar: The pit hangar was originally constructed to service a single podracer. As the sports popularity grew, bays were enlarged to service multiple podracers crammed with their own pit crews and teams. Mos Espa Arena Grandstand: The immense grandstands of Mos Espa Arena are cradled within a natural canyon amphitheater on the edge of the Western Dune Sea. Once inside the arena, fans are able to visit the various concourses where they can place bets, purchase souvenirs and visit exhibits. OK...this is an easy question. What is infinitely better than a paint peeling Jingle Vader and would still fit right in with the holiday there? Padm� Amidala in her snow gear! We've decided to (finally) add her to the Gentle Giant Visual Guide today to take your mind of red Sith Lords. Click the image below and let the thought of that Vader just melt away! Today your favorite scoundrel is added to the Gentle Giant Visual Guide. Han Solo sports his blaster and a look that even a princess can't ignore! Take a look at the images of this great mini-bust below and then head over to Andrew's Toyz to check out their selection of Gentle Giant items! The rumored Exclusive Holiday Darth Vader Action Figure is rumor no more! Though not quite in the style of Santa Claus, Darth Vader comes decked out in his own red suit. You can head over to the Star Wars shop today and pre-order your Jingle Vader today by clicking on the image below! Today's addition to the Customs Corner comes from Jedi Temple War Room forum member Shawn...a.k.a. Master Fett. He sent in a bunch of Jedi, some bounty hunters, droids and a clone! Send in your customs to customs@jeditemplearchives.com and not only will we post them for you, but you'll have a shot at this month's prize in our Customs contest! The Star Wars Shop has just received their shipments of two long awaited arrivals and they are ready to ship! The SWS Exclusive Black Chrome Anakin Skywalker Scaled Replica Lightsaber is a must have for Master Replicas collectors and those of you looking to add something special to the collection. And....the Remote Control R2-D2 in 3-3/4" style is in...get this awesome little droid that comes with all the bells, whistles...and wheels! The POTF2 guide continues with its updates today. Rounding out the orange carded line is Luke Skywalker (Jedi Knight), and from the green carded line is Grand Moff Tarkin. Stay tuned as we continue to roll out POTF2 updates during this lull in new product. Attention Midwest Troopers, the Chicagoland Entertainment Expo will be held this weekend in Itasca, IL. Some of the Star Wars guest include: Peter Mayhew, Kenny Baker, Ray Park, Daniel Logan, Paul Blake, Mary Oyaya, Orli Shoshan, C. Andrew Nelson, Doug Wangler and many more! Checkout the most affordable Star Wars show this year and help out the kids at Treasurechest.org by attending the Celebrity Charity Breakfast or Dinner. Stay tuned to Sandtroopers.com for complete coverage from this event. Collectors Society Members get your credit cards ready because in September Master Replicas will be offering up the Obi-Wan Kenobi EpI Lightsaber Elite Edition! If you are not a Collectors Society member yet, head on over to Master Replicas and sign up before the piece is offered...the Elite Editions tend to sell out in hours! And, Hyperspace members don't forget to stop by and enter their sweepstakes for a Gold Yoda Lightsaber or the Choose Your Destiny Sweepstakes where anyone can enter to win a 1 of a kind set of Anakin and Vader gold plated F/X sabers! Need another chance to win something...how about the Studio Scale Snowspeeder...just click here to enter! 2 Imperials make our daily update today: both from the POTF2 line. Both of these early POTF2 figures didn't make the cut and were replaced later with newer, more accurate sculpts. But, they will always have a place in our guides! Brianstoys.com announces that they have the Master Replicas Darth Vader Helmet and Stormtrooper Blaster up for order. Also stop by to pick up a set of the Mpire Plush and much, much more! Head on over to Brian's Toys today! FACTS 2005 - the biggest science fiction, comics, fantasy & anime convention in the Benelux - will cover an entire weekend (15-16 October 2005). Once again, the I.C.C. (Internationaal Congres Centrum, Citadelpark, Ghent, Belgium) is the place where all the action will happen. The main room (almost 5.000 square meters!) is rapidly filling up with dozens of dealers (shops, private collectors, fanclubs, organisations, editors, etc.). We're building an actual fan village of some 800 square meters where you'll be able to see different (replica) props from your favourite movies, meet with other fans, see some wonderful sword fighting demonstrations, participate in all kinds of quizzes and competitions, witness the cos' play contest! As usual, we'll be welcoming different guest stars. We're still working on further additions, but we can already tell you that the following actors will be attending our show:...Corin Nemec (Parker Lewis), Jonas Quinn (Stargate ), Jerome Blake (Star Wars Saga), Neil and Adrian Rayment (Matrix Twins), Richard Bonehill (Star Wars Saga) and Warwick Davis! Your favorite artists like Joe Jusko, Romano Molenaar, Chris Evenhuis and Liam Sharp will also be there! Click here for more information and to reserve your tickets today! 1st 7 of Last 12 - Carded! Carded images of the first 7 of the last 12 ROTS figures have shown up at eBay seller Andrew's Toyz! Take a close look at all the cards by clicking below! A pair of our favorite hunter and hunted have been added to the Galactic Heroes section of the Young Kids Visual Guide today! Boba Fett and Han Solo Backpack Heroes start off this portion of the line. Click below to take a closer look! Scott S. sent in one of his great customs to share with us in the Customs Corner today. And...he also was kind enough to share his recipe! Click the images below to check out his version of a seated Emperor Palpatine! Don't forget to send in your customs to customs@jeditemplearchives.com and be entered in the draw for this months Customs contest! More updates for the POTF2 visual guide, this time a pair of rebels. Click below to check out more figures from the POTF2 line as we continue to fill the holes of some of the older guides. Many more new items are scheduled for September, so make sure to stop by Andrew's Toyz frequently. Some items expected: Busts, Maquettes, and FX Lightsabers should be arriving very soon. James Montague send in his customs for the Customs Corner and is entered in the draw for this months Customs contest! Check them out by clicking below and send in your customs to customs@jeditemplearchives.com and join the fun! The M-Pire section of the Young Kids Visual Guide gets the company of the Galactic Hero style Luke, Leia, Han and Boba Fett today...from the sultry look of Leia, to the confidence in Han and the worry in Luke's face these are fun figures to add to any collection! Check them out below! More Revenge at Burger King! Burger King will feature 17 more Super-D figures this fall along with the release of Revenge of the Sith on DVD! The set wil include Cosmic Cruisers, Shadow Casters, Galactic Spinners, Jedi Wisdom and chase Darth Vader with a voice chip. Read about these and a series of SW watches at the Official Site. Todays addition to the JTA Customs Corner comes from Eric aka, Jedi Style. He send in a custom Jedi Knight by the name of Sanik Tae! Check it out by clicking below and then head on over to the War Room forums to talk about it! Don't forget to send in your customs to customs@jeditemplearchives.com and be entered into this month's random draw for an autographed photo of Julian Glover, a Post-OTC Sly Moore and Queen Amidala in her Naboo Celebration outfit! MouseDroid.com reported the 2005 cancellation of the last wave of the 7" Unleashed line and then our Jedi Archive Research Droids uncovered that the figures could resurface next year. Well, Hasbro's update today officially lets us know that the line will return to retail next fall and it will include the Shock Trooper, Han in Stormtrooper Disguise and ROTS Chewie! Way to go Hasbro! Time to take a stroll down to the Star Wars Shop and pick up a few essential items! The Kotobukiya Snowtrooper and Star Wars: Clone Wars Volume II DVD are both up for pre-order and are must haves in any collection! Stop by today and reserve yours now! All right, we normally don't post news about video games, but by the looks of what Battlefront II will be like there is no way we could not let you know! If you have not been to the official Battlefront II web site, so there now and check out all the new worlds, vehicles and characters you can play. If battling as Ki-Adi Mundi on Dagobah or flying a V-Wing or trying to take over the Death Star or Tantive IV doesn't get you going nothing will! Don't forget to pre-order your copy while you're at it! Todays update features a pair of POTF2 Luke's. From the wave that restarted it all, 'buff' Luke, and the first Luke Skywalker to be offered in his ceremonial outfit. Check out the POTF2 visual guide for more blasts from the past! Our newest section of the site is open for business and that means all you customizers out there now have another home to display your masterpieces to the Star Wars community! The JTA Customs Corner kicks off with customs from two different people...to start off with you get to see a few of my own ...I did them a few years back and then being a webmaster took up my time so things have come to a screeching halt! Our second collection, and one worth looking at much more than mine, is sent in by Jeffrey Van Hove of Belgium. He took customs to a place where few people have...the Clone Wars Animated Series and created Yoda's Kybuck Steed in all the style of Genndy Tartakovsky! Don't forget that when you send in your customs to us this month, not only will they have another home but you'll be entered into this month's random draw for an autographed photo of Julian Glover, the man who played General Veers, but a Post-OTC Sly Moore and Queen Amidala in her Naboo Celebration outfit! Just end them in to customs@jeditemplearchives.com with descriptions of the customs, your name, location and even a description of the work if you like and we'll take care of the rest! Enjoy! 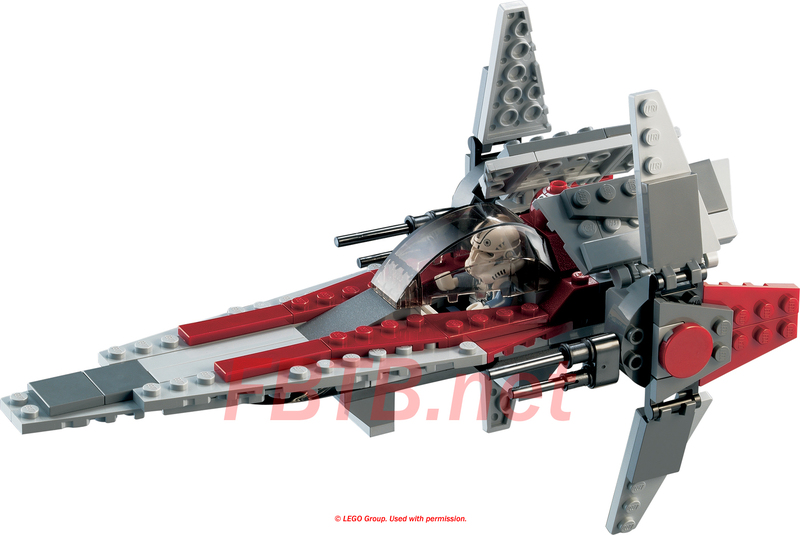 Another cool ship from Revenge fo the Sith has been added to the LEGO Visual Guide today. The Droid Tri-Fighter is a fun model to build, looks great and comes with a Buzz Droid! Take a closer look below! The September Contest has been revealed and this month the prize is not only an autographed photo of Julian Glover, the man who played General Veers, but a Post-OTC Sly Moore and Queen Amidala in her Naboo Celebration outfit! In the next day or two the JTA Customs Corner will be open for business and we'd like to invite you to submit your favorite customs to share with the Star Wars community. All you need to do is send an e-mail to customs@jeditemplearchives.com with the images, descriptions of the customs and your name and location. Heck, if you want to do a little bio on why or how you do the customs, we'll add that to your page too! At the end of the month we'll enter all the names into a random draw to select the winner! Thanks to Autograph Bounty Hunter and Figures Direct for sponoring this months contest. May the Force be with you! The POTF2 visual guide adds another playset today, this time the Hoth Battle Playset. Click the images below to have a look at this detailed playset full of trenches, a firing cannon, and a turret. Andrew's Toyz has listed some great new pre-orders. These are sure to sell fast, so why wait, head on over to Andrew's Toyz now and reserve your's today! New Koto on the Way? There are no images yet, but Hobby Link Japan lists Commander Bly in their Kotobukiya section as a pre-order that will ship in November...check out the listing right here. The Official Site has been updated with news about the release of Star Wars: Clone Wars Volume 2! The DVD is set to be released on December 2. The bonus material includes a feature called "Connecting the Dots" which describes the creative process and how they connected the animated series to Episode III, two full galleries of animation concept art, storyboards, and sketches, as well as trailers for upcoming the upcoming Star Wars: Empire at War and Star Wars Battlefront II video games! Those of you who caught last weeks premier edition of the Star Wars Action News and are waiting for the next edition need to wait no longer. The second podcast is now up at ReviewStarWars.com and it is worth catching! For those of you who missed out, have no fear last weeks podcast is still on line. So, what are you waiting for, head on over can catch the latest details on the ROTS Falcon, Code3 posters and more! ....and more, so please take a look and remember 100% of the winning bid goes to help the folks effected by the hurricane. The LEGO Visual Guide received a "mini" update today with the addition of the three Revenge of the Sith mini sets! The ARC-170 and Anakin's Jedi Starfighter were available from TRU while the TIE Interceptor was at Albertson's. They were also available through special deals from LEGO Shop at Home and the one of the ROTS ships will be packed in with the upcoming LEGO Collector's Set (Droid Tri-Fighter and ARC-170) which will also include a poster and a CD-ROM. The Gentle Giant Visual Guide gets a double boost today. We added the Padm� from the 2002 line to round out the initial year of the mini-bust line. In addition the Han is Stormtrooper Disguise that was offered directly from Gentle Giant fills out the exclusive busts to date. Check out the images below for a closer look at both of these mini-busts. With the HUGE amount of ROTS merchandise recently released, it took us nearly 5 months to fill the guide to the point that we are now nearly caught up! We thought we would take advantage of this short lull to bring out some older stuff to the guides. So, today we make an update to the POTF2 guide, featuring the Endor Attack playset. While not a full blown playset, it does make a nice centerpiece for a diorama, or a battle (if you are into actually playing with your toys). Check out this thread in our forums to see one way you can turn this nicely detailed bunker into a cool display shelf/diorama. Plus, it has a catapult! How cool is that? Figures Direct just got stock in of the new The Sith and Clone to Storm Trooper Evolutions sets just yesterday. These sets of figures have so much detail and articulation that they are not to be missed! Head on over to Figures Direct now and place your order before they are all gone! The cool guys who know their Star Wars LEGO over at FBTB.net have images of the 2006 V-Wing that is in store for us early next year! Check their main page for the full story and click here for a Hi-Res pic! The the guys from Down Under at MouseDroid.com have word that the final Unleashed wave consisting of the Shock Trooper, Stormtrooper Han Solo and EP3 Wookiee Warrior have been cancelled. If this news proves true (and it usually does when it comes from them) then this is just the icing n the cake in a purely disastrous move by Hasbro. Hasbro has posted info on the new improved Collector Cases that are being sold exclusively at Target. The sport a redesigned shell to accommodate all the ROTS figures, thinker plastic and improved side grips to keep the figures safe. Click below to learn more. As a bonus review today we offer you this "Quick Shot" of the new Revenge of the Sith TIE Fighter so I could to get some info out on it to you as quick as possible! Look for a full review with images coming soon, but this should hold you over for the time being! Read it right here! Congratulations to Peter Mantzioros of Laval, Quebec!! He is the lucky person whose name was pulled out of the hat and wins this months Collections Contest!! He won the ultra cool Kenny Baker autograph from Revenge of the Sith! Thanks to all who entered and to the Autograph Bounty Hunter for donating this months prize! And don't forget...the Collector's Room is always open, so send in your collections and updates any time to collections@jeditemplearchives.com! Tune in next week when we launch the next one...want a hint of what it is...jump to this section of our forums for a clue! The newest of the Research Droids Reviews is hot off the presses and focuses on Revenge of the Sith figure #06, the Clone Trooper with Quick Draw action and his famous partner from the Shock Trooper regiment. Click here to read the review and see what these2 figures have to offer to the Grand Army of the...Empire. As the days pass by the situation for the folks in the path of Hurricane Katrina continues to worsen instead of becoming a distant memory. Please take the time to remember all the folks who have had the world turn upside down on them by taking some of the money that we all use for a hobby and donate it to the Red Cross. They will see that it will goes directly to aiding those who have lost everything they hold dear in life. New Gentle Giant and Kotobukiya products are available for pre-order at Andrew's Toyz. Pre-order and save! �	Darth Maul Statue by Gentle Giant - $21.00 off MSRP! �	Luke Skywalker on Tauntaun Statue by Gentle Giant - $20.00 off MSRP! �	Lando Calrissian in Skiff Guard Disguise by Gentle Giant - $9.00 off MSRP! �	Snowtrooper by Kotobukiya - $30.00 off MSRP! �	Anakin Skywalker EP3 by Kotobukiya - $30.00 off MSRP! �	Darth Maul by Kotobukiya - $31.00 off MSRP! �	Clone Trooper (501st) by Kotobukiya - $22.00 off MSRP! �	Yoda by Kotobukiya - $10.00 off MSRP! Start shopping and saving at Andrew's Toyz! More clone 3-packs have been added to the Revenge of the Sith Visual Guide today. The all colored 3-pack and the green clone with his 2 clean white clone buddies join the rest to round out that section of the ROTS Guide! Don't forget to stop by Alliance Collectibles to get these and all the other army builder for your collection! Grand Admiral Thrawn - 637 Didn't vote yet? Do it right here! Today's Hasbro update focuses in on the Early Bird Figures. There are some additional packaged photos and news of a November ship date...check out the article by clicking the image below! Our good pal Chris over at The Jawa has been hard at work trying to help find a cure for diabetes any way he can since his son was diagnosed with it last year. Last year, in hid debut year to try and raise funds he was able to donate over $8,500 to the cause through the help of his family, friends and the Star Wars Community and this year he is trying to do even better! You can read all the background about his son and the fight to cure diabetes over at his son's personal web site Chrisosaurus Rex. There you can track the progress of the fight and donate to the cause through the Juvenile Diabetes Research Foundation. By contacting Chris at chrisd@thejawa.com you can purchase one of the way cool Lucasfilm approved t-shirts below. The t-shirts are limited to just 500 so don't delay in placing your order! A link to Chrisosaurus Rex can be found in our Affiliates section on the right hand side of the main page so you can track the progress and send in a donation when the time is right for you! This years walk is right around the corner on October 16 so why not pay a visit today and help out many while helping one of our Star Wars community's own! Gentle Giant - Darth Maul! One of the pieces that we have all be waiting for will finally be released this February...the Darth Maul Statue. You've seen the images already, but now start saving to purchase the first of the Sith we all came to know in the flesh! Check it out over at Gentle Giant! Do you want to know what the future holds for Lucasfilm? Which character from the Saga does he relate to the most? ...and when will he get back to making more Star Wars movies? If you're a Hyperspace member you can read the (sometimes) surprise answers to these questions and more in an exclusive interview with George Lucas right here! Of course, remember that this interview was conducted in 1989...but it's still fun to read!